Lock in a great price for Royal Palms Resort & Spa-in the Unbound Collection by Hyatt – rated 9.1 by recent guests! Great pool area. Not too crowded. Great service. Beautiful setting. Close to Phoenix and Scottsdale areas. The resort is breathtaking. We will be coming back soon. Comfortable beds, luxurious soaking tub and large shower. Nice patio for coffee and cocktails. While our stay was brief, the experience was salubrious! Driving onto the property as I realized we were at the base of Camelback Mountain, the resort tucks you in, and the world that was your reality moments before simply melts away; and while that same world will be waiting upon your departure, the time spent with Royal Palms will return you to that world with a delicious little spring in your step! Room was spacious and comfortable. Common areas were well maintained and comfortable. Seems like it would be good for family vacation with pool, gardens and activities on site. Grounds are beautiful! Staff were professional, courteous, and treat you like royalty. Everything about this resort is perfect. It’s magical around every corner, the staff is hands down some of the best. There’s no reason to leave! Will definitely be back. Staff was friendly & helpful. Breakfast was fabulous. Pool was relaxing. Grounds were beautiful & clean. Landscaping and layout of grounds were beautifully done. Room was quiet. Royal Palms Resort & Spa-in the Unbound Collection by Hyatt This rating is a reflection of how the property compares to the industry standard when it comes to price, facilities and services available. It's based on a self-evaluation by the property. Use this rating to help choose your stay! One of our best sellers in Phoenix! 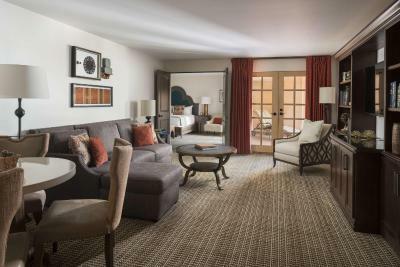 In an ideal location between the prestigious area of Biltmore and downtown Scottsdale, the Royal Palms Resort & Spa is a beautiful hideaway resort. Surrounded by citrus groves and exotic foliage and with the stunning backdrop of Camelback Mountain, this resort is a true oasis in the desert. 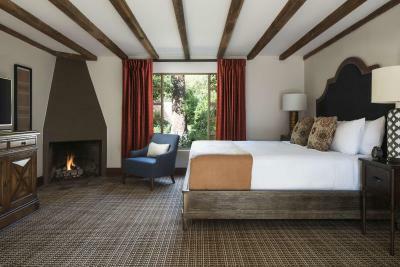 This historic hotel has the feel of a Spanish villa – lush walled gardens, stone walkways, antique water fountains and delightful courtyards all add to the atmosphere of the resort. 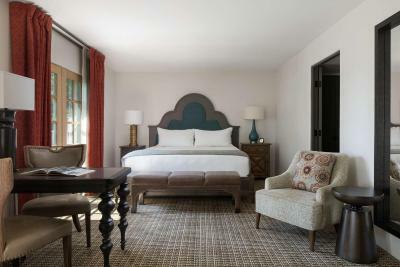 Accommodations are of the highest standard with decor ranging from classic European to opulent contemporary. Each includes free Wi-Fi and a nightly turn-down service. 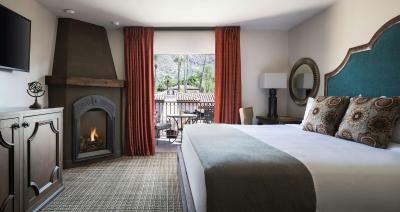 The hotel is just 7 miles from Phoenix Sky Harbor International Airport. 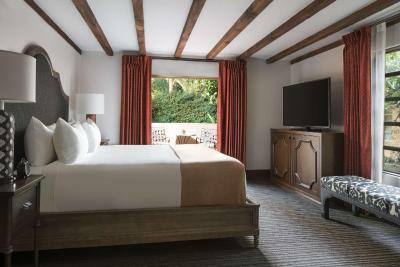 The Royal Palms Resort & Spa is a proud member of the Historic Hotels of America, National Trust for Historic Preservation. When would you like to stay at Royal Palms Resort & Spa-in the Unbound Collection by Hyatt? 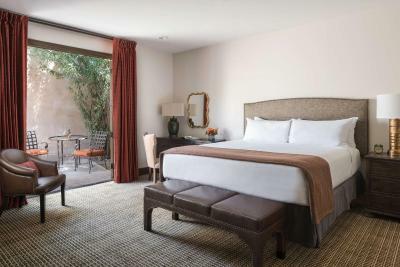 This triple room features a balcony, mini-bar and patio. This triple room has a balcony, flat-screen TV and tea/coffee maker. This suite features a balcony, tea/coffee maker and patio. This double room has a flat-screen TV, tea/coffee maker and mini-bar. This quadruple room features a bathrobe, tea/coffee maker and sofa. This suite features a balcony, patio and bathrobe. House Rules Royal Palms Resort & Spa-in the Unbound Collection by Hyatt takes special requests – add in the next step! Royal Palms Resort &amp; Spa-in the Unbound Collection by Hyatt accepts these cards and reserves the right to temporarily hold an amount prior to arrival. Royal Palms Resort & Spa-in the Unbound Collection by Hyatt accepts these cards and reserves the right to temporarily hold an amount prior to arrival. Only pets under 35 pounds are permitted at the hotel. Charges apply. Please contact the hotel for prices and details. There was nothing we did not enjoy at this resort, it was very beautiful and the staff was outstanding. We only stayed one night as we were passing through town but fully plan to come back for a long weekend getaway in the near future! Everything, the staff was great and made us feel welcome and answered everything before we asked. The property was very beautiful, much better then expected. Thank you!! If I were to rate this resort I would give it 97% out of 100%. Everything from start to finish with my stay was amazing! The only three reasons why I wouldn’t give it a perfect 100% is because it’s not adults only, they don’t have a pool area that was only for adults, and I think for couples who are honeymooning like myself, the resort should have something special in your room to celebrate the occasion or offer a discount for couples massage. Hands down it was the most romantic place I’ve ever stayed. If you’re looking for somewhere quiet, relaxing, and romantic this is the perfect place. Just keep in my if your honeymooning this isn’t going to be an adults only resort. I love the smell!!! Everywhere you went on the property from the time you 1st arrive to check-in was this sweet calming aroma that instantly remind me of a relaxing spa and it was so refreshing!! Not the room I requested, loud location in hotel, something wrong with the sheet size and the bed, location of bathroom not convenient for two coworkers traveling together. Again, loud neighbors above or next to room. More affordable as far as room rates. It was a very beautiful resort and the staff and accommodations were amazing. I would love to go back again and would highly recommend staying here. The valets where rude, very rude. The rooms had a musty smell that just made us think of an old folks home. The shower head was horrible. Could not get enough water out if it. The setting, landscape, and historic site. A few things: 1) A small thing: It would have been helpful to have a dresser so we could keep our clothes more neat. 2) A bigger thing: I found the restaurant and bar to be disappointing, and there are not other options for food unless you take an uber. The restaurant itself is beautifully decorated. However, our waiter was the sole exception to the wonderful service. He was arrogant and did not give very attentive service. I would say the bartenders were the same. Also, and this is my biggest complaint, the food was not that good, and it definitely did not justify the cost. We spent over $650 during our 3 day stay (admittedly, this included quite a few cocktails, which are $15 each and small). If you want details: The bad: the wild mushrooms had no flavor; the croquettes were like mouthfuls of salt; the brussel sprouts were great the first time we ordered them, but the second time they were barely browned and the bacon in them was actually just like raw cubes of fat; the steak was overcooked; the egg white frittata was dry and had a plop of unappetizing grey "pesto" on it; and the breakfast potatoes were fried into hard nubs. The better: the branzino was ok; the seared tuna appetizer was good; the brioche french toast was good; my eggs were cooked properly (poached, which is easy to mess up); the guacamole was good; and the blt was decent. This is a wonderful place for a romantic weekend getaway. The property is beautiful. The original portion was once a vacation home, and the additions have been done to scale with that portion. That means it has an intimate, cozy, and private feel. There are many beautiful sitting areas, fountains, and garden areas. It was very peaceful, which is impressive given that while we were there no fewer than three weddings were held on the property. We loved the relaxed pool area and we were glad that there were no kids there when we were there. It does not seem this would be a good property if you want to have a noisy family pool scene. The staff was wonderful- professional, helpful, and friendly without being sycophantic. The room was very comfortable. The bed was fantastic. There were thick windows/doors that kept out the noise, and very effective blackout curtains that keep out the light. I loved the big bathroom and the soaking tub, and the complimentary shampoo/conditioner/body wash smelled wonderful. I loved the live music in the bar. The price and all the add ons that are not mentioned when booking. T Cooks is vastly overrated and overpriced. Room interior old, fixtures broken. Staff very friendly and grounds beautiful. Very beautiful resort and pool, great staff and very happy with everything!